Pub, Belgium’s nr. 1 advertising magazine asked us to do a cover for their Cannes issue. We’d been playing around with Augmented Reality internally for some time and we quickly seized the opportunity to use it for a real client. With the economic recession in full force, it was hard for advertising agencies to justify sending a lot of people to the real life Cannes ceremony. 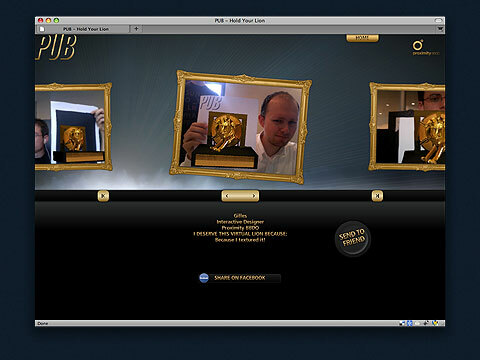 Using Augmented Reality we could allow people who stayed in rainy Belgium to pretend holding a real golden Cannes Lion statue in their hands. Using 3Dsmax and Photoshop CS4 it fell upon me to optimize and texture the 3D Lion for use with Papervision 3D. Over 2000 visitors cherished their virtual lion. The campaign went viral and before the end of the second day even Chinese ad-men were posing with their lions. With this Pub was the first Belgian magazine to feature Augmented Reality on their cover and Proximity was the first Belgian agency to use this new technology for an actual client. You can still try the site yourself at www.holdyourlion.com. Pub Magazine’s jury gave us a special mention for the Pub Cover Award 2009.